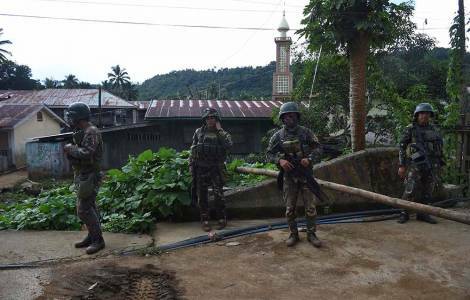 Manila (Agenzia Fides) – A local Catholic bishop has deplored suspected plans by a group, of IS inspiration, known as Maute, to use civilian hostages as suicide bombers to attack security forces. According to a report sent by the Philippines Catholic Bishops’ Conference to Fides, Bishop Edwin de la Peña y Angot, a member of the Mission Society of the Philippines M.S.P. and charged with the spiritual care of Marawi prelature said such "desperate" acts deserve nothing but strong condemnation. "horrible…to be condemned! These terrorists are clearly desperate to even imagine something like this ", said Mons. de la Peña. "These militants planning something tremendous, think the government will listen to them", he said. Although clashes continue, the army says that less than 40 militants are still in the area three months after hundreds of armed men attempted to take the city (see Fides 6/07/2017). Reportedly some 46 civilians are being held by terrorists, among them is Catholic priest Fr Teresito "Chito" Suganob, Vicar General of Marawi prelature.